Every Dive is an Adventure joins 'ILFSAC' on a day out from Ilfracombe harbour, diving off the coast of North Devon. Lundy is a well known local dive spot, but ILFSAC want to explore the less known waters right on their doorstep. They've invited Seasearch (a national organisation which records marine life) to help them document their findings - and along the way they visit one of the many local wrecks. Shaun Galliver chairman of Ilfracombe and North Devon Sub Aqua Club (ILFSAC) joked several times ‘how come the sun always shines for Boat Stories? No pressure then? !” The sun shines of course, because like us, it wants to show off beautiful North Devon at its best. The morning of our dive shoot, I drove through heavy murk until I crested the hill which leads down to the Ilfracombe harbour, where the sun was just breaking through the clouds highlighting the masts of the yachts and the colourful charter boats. The real pressure on Shaun, wasn’t the sun – it was calling the ‘viz.’ North Devon is notoriously fickle when it comes to diving. It has the second highest tidal range in the world, rivers which dump silt every time it rains heavily and the sand and mud in the Bristol channel gets stirred up every time there’s a slight swell. This is why it is relatively unknown and unexplored and this is where the adventure comes in... The title for our film comes directly from Shaun's words on camera "diving off the coast of North Devon is a challenge and we never know what we are going to find, whether we're looking for a new wreck or new marine life - every dive is an adventure." For me it was an exciting adventure into two new worlds. I'm not a diver and although I'd always wanted to promote Lundy's marine life and sing its praises as the first official marine nature reserve and conservation zone, I had no idea of the riches to be found even closer to home, right if you like - as the cliffs shelve down into the sea, on our doorstep. I came away from that meeting with no fewer than seven possible stories in this order in my notebook. 2) Iona ll wreck trail - a bit like a walking trail but for divers of course! Shaun stayed on board, acting as diving safety officer that evening. Like most of our boat stories characters he is not someone who would naturally choose to appear on camera, and is unaware of how interesting his life is to others. Born in Ilfracombe, his father was a lobster fisherman and Hele Bay: the beach and the water was his playground. He swam, snorkelled and learned lobster potting from his father, "as soon as I could walk, but Dad always told me work hard at school and don't end up doing what I'm doing." So Shaun went off to Uni to study Geography and worked as a surveyor. He also learned to dive. And when he finally had the chance to choose where he could live, like so many people born in North Devon, he was drawn back, bringing Mel his partner with him. 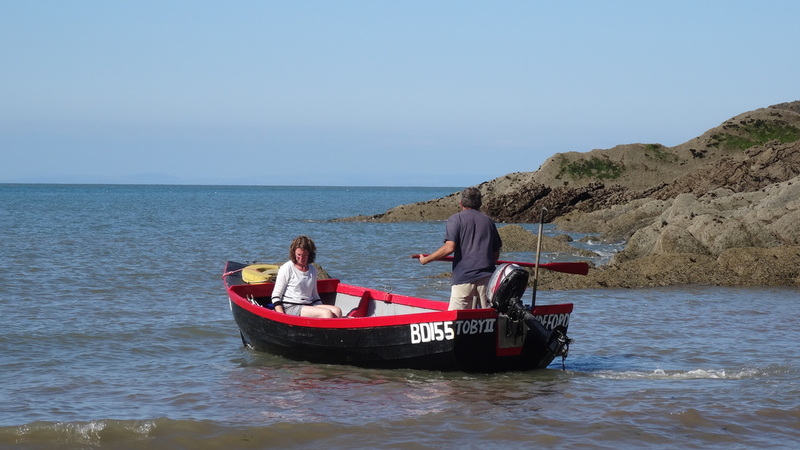 They are now doing up his parents house in Hele Bay and Shaun is back lobster potting in his Dad's tiny boat. As a diver, Shaun also does something unique in North Devon, he hand dives for scallops. I would love to have filmed this - the most sustainable way to fish for scallops, but new regulations this year extended the closed season from June until September. "This is when the viz is at its best and with the cost of the commercial license and the few chances we have to get out, it's just not worth my while doing it," said a frustrated Shaun. There is another quarry which tempts Shaun into the water, whenever conditions allow. "Alright I'm a wreck head," he says with his boyish grin. I was tempted by the boy's own adventure story of the unchartered wreck the club was planning to survey. But it involved highly skilled technical divers, diving deep in the channel and already outside my comfort zone, I was worried about visibility and safety. I had this dramatic image of a ship's hull from the film Titanic - but out in the channel wrecks tend to be broken and scattered -and if there's a current running powerful lights are needed to penetrate a blizzard of plankton and detritus. I'm always drawn to colour and I was tantalised by Maggs Ashton's photography. I had seen her pictures in the club house and was bowled over by the colours and variety of marine life. I was that child in the sweet shop, looking at the different coloured corals lined up like old fashioned sweet jars which are so beautifully described by Sally Sharrock in our film. As she showed me her photos Maggs explained that the anemones are territorial and reproduce by budding, which is why those of the same colour clump together. I love the way Maggs is so fiercely passionate about the wildlife on her local patch "when I show someone a cuckoo wrasse or a colourful sponge they say that must have been taken in the red sea - I keep having to tell them - no! I photographed it here - a few miles offshore." Maggs is an accountant by day, but through the summer, along with her husband Steve Ashton (who also volunteers for the RNLI) if conditions are right - she's out there recording marine life. As the club members talked, the same evocative names kept cropping up: Horseshoe reef, the wreck of the Woolaway, Combe Martin reef, Jack's wreck, Morte Point. 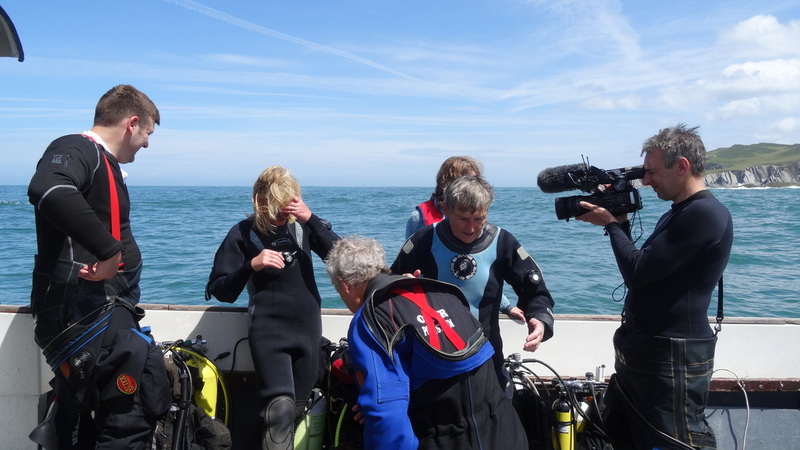 It became clear that Shaun and Magg's passion was not heading out nearly 25 miles to Lundy, which because of the likelihood of better viz they considered the easy option, but exploring the unknown world: the underwater reefs, caves and wrecks on Ilfracombe's doorstep. As Shaun says, "it's the club's ethos to train people up and get them diving locally." So we decided to try and film the club's favourite, local dive spots. And when they invited some experts from Seasearch down to record marine life - we were invited onboard. Back to our filming day. As soon as we set off, the sun went back into hiding. I'd been receiving messages through the week from Shaun that the viz was looking promising and Maggs had been out over the weekend to check the sites they wanted to dive. So when the first diver went in and popped up minutes later to say the viz was crap my spirits sunk. All it had taken was a slight swell to kick silt over a dive spot which had been clear the day before. But Shaun and Maggs are glass half full people and the Seasearch volunteers were determined to persevere. To my amazement, Sally Sharrock from Seasearch, came back up from the first dive, fizzing with excitement about what she'd seen. 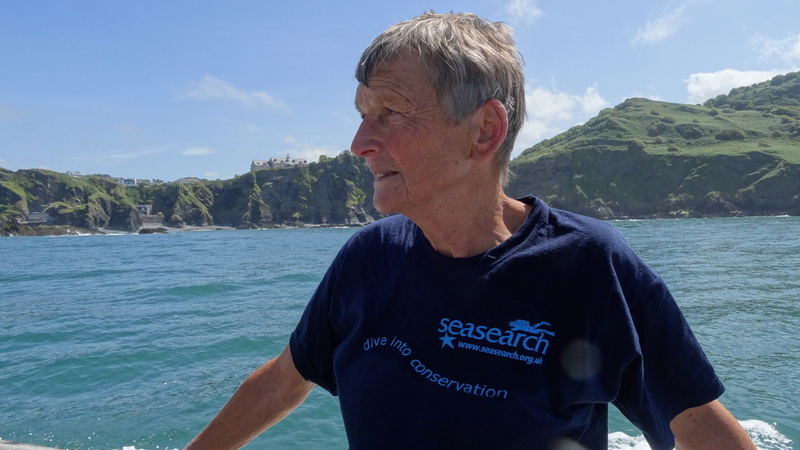 Seasearch, as Sally she says "is an organisation which encourages divers to record what they see - and then makes the data available for conservationists and other marine users." 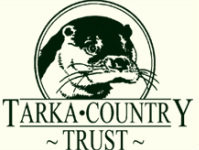 They encourage all divers to join them and are prepared to give up time to come out to new dive sites and train people up to recognise species. A bit like learning a new language, it may seem hard at first - but it's not impossible. Maggs has nearly finished her Seasearch training - she has to do two more dives with an expert like Sally who can check her records and then she's away. She's hoping to train and encourage other divers, not just from Ilfracombe, but clubs like Appledore too. This is crucial work at a time when the UK is trying to set up more marine conservation zones. So little is known about what is down there. 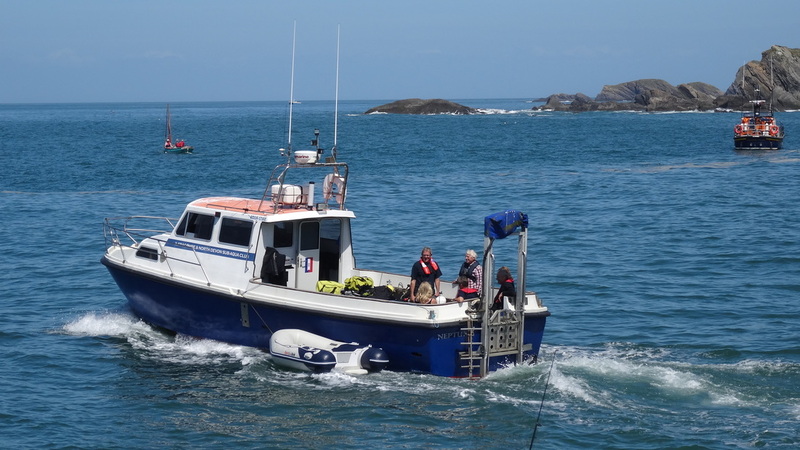 North Devon was one of the first areas to plan a marine strategy with the North Devon Biosphere working in partnership with fishermen and local divers from Appledore and Ilfracombe. Our dive day got better and better. The viz improved, the seasearchers wrote up their notes, the others told more and more tales, Mel got out her seed cake and filming over, we basked in the sunshine. Back in Ilfracombe harbour one of the vehicles was dispatched to take the gas bottles back to the club house while the rest of the crew walked back via their favourite ice cream stall. And then we ended up in the club house bar. And OK I was a little bit greedy trying to squeeze the magic of the colourful underwater wildlife and the mystery of the unchartered wreck into one short film - but I think it works! The sun came out as we picnicked on the boat and the divers discussed where to make their second dive in the hope of finding better viz. I had my fingers crossed that they would dive a wreck. Wrecks create new reefs so they are magnets for wildlife and this would allow me to touch on the wreck story too. The Woolaway wreck is a big club favourite but finally they plumped for the wreck of the George Lambe, sitting half way between Bull Point and Morte Point. As Shaun says in the film, the bell hangs in the club bar. On camera out on the water Shaun told us, "around 1910 Cardiff was one of the world's busiest ports and in one year 13 million tonnes of coal or 300 ships a day travelled past Ilfracombe. Many of those either hit rocks or hit each other so we still have a lot of undiscovered wrecks here. We found four last year and even last week we dived two new ones. It generates alot of excitement - it might have been down there for 150 years and you're the first person on it - it's always a good feeling." Until that point, I hadn't realised quite how many wrecks were down there, how many virgin wrecks the club was finding and the fact that they could offer their members a real chance to boldly go where no man or woman has gone before - and discover something new. No wonder technical divers like Mike Tickle travel miles to be able to dive with ILFSAC. Thank you Mike for letting us use footage of the newly discovered wreck Shaun mentions in the film. I leave you with this gem below from Keith Denby who was our skipper for the day. HUGE THANK YOU to Shaun, Maggs, Mel and Keith from ILFSAC who made us so welcome -to all the other members we met including Brian Watts and Chris Mandry - to Sally, Chris and Keith from Seasearch for being so patient while we were filming. And to Maggs, Sally and Mike Tickle for use of their images (& Matt Biggs for the spider crab) all shot in North Devon. BIG thanks to to Rich Stevenson from Diving & Marine Solutions - a highly professional underwater cameraman whose company provides safety boats divers, underwater kit and professional cameraman who bravely agreed to film both topside and underwater for Boat Stories so that we wouldn't bust our budget. During editing I enjoyed my visits back to my old stomping ground the beautiful Erme estuary. Many thanks to Rob Hill safety diver for looking out for all of us. And thanks to Jay Jordan from Woolacombe for composing and turning around the music so quickly to our deadline!